Just days before the first Indianapolis 500 representatives of numerous automobile companies answered the question, "Why race?" This article presents their rationale and makes for fascinating reading. Without exception, all the maunfacturers questions stress the tremendous value they derived from sustatined, high speed racing. Among those interviewed: Marmon, Fiat, Cole, Cutting, Stutz, Case, Jackson and Knox. Fiat presents a nice slice of history, discussing their success at the 1908 Targa Florio with Felice Nazzaro. 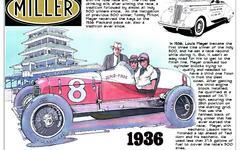 David Bruce-Brown was their star driver at the Indianapolis Motor Speedway. One manufacturer, the Columbus Buggy Company seemed to equivocate somewhat, suggesting that short duration events were not all that worthwhile, but that manufacturer dervived value from 500-mile to 24-hour contests.